I just got my most recent order from Repro Depot and can't stop thinking about it quietly nesting in a box beneath my desk. 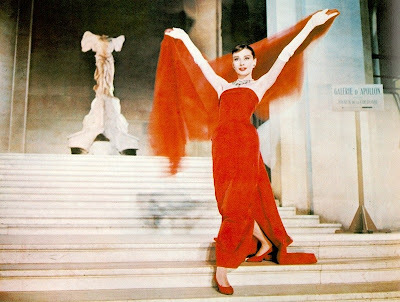 I did take a peak and pulled some of the fabric out but what I really wanted to do was whip it out of the box and run down the long hallway at the office holding the fabric above my head and letting it blow behind me like Audrey Hepburn in Funny Face. The best thing about getting an order from Repro Depot is the packaging. They take such care in putting everything in plastic zip lock bags (which I will reuse over and over again). 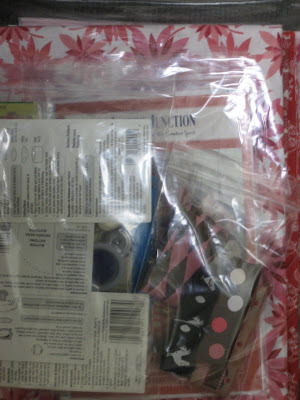 The fabric was all packaged together, my notions were in a separate bag inside of the fabric bag and my ribbon was in it's own little bag as well. What a great job they do, you can tell they care about the product they are selling and about the customer that they are shipping to. Thanks Repro Depot! Now I am even more excited than I was before to jump on my Christmas gift making. The one thing missing from my flat is a washer dryer so I can get everything washed and ready to go - pooh. Oh well, just like new dishes, I don't mind washing new fabric and pressing it when I am done. My Mom and I have this in common. I actually had to call her in Michigan when I got my box and tell her how hard it is to sit here at my desk knowing it is under there calling me. I wonder how long I am going to wait to make the first cut into it? That is tough sometimes. There is something very satisfying to me about having a large piece of clean, pressed, uncut fabric. The options are endless and I just want to make sure I make the right decision before cutting it. You know? Anyway, back to my lunch break. I just ate the largest peach ever born. You can see it at Magpie and Mocking Bird. I do have a project lined up for tonight. I am going to (God wiling) install some shelves in my entry way which doubles as my little teeny tiny craft space. I will try to post before and after photos when it is all done. I am going to need to go to Ikea tomorrow to get a couple more storage boxes I am sure of that! Wish me luck!